Common Cause Hawaii supports overturning Citizens United, the Supreme Court decision that opened the floodgates for unlimited spending by Super PACs. With YOUR support Hawaii is the first state to have all counties and the state legislature affirm their support to overturn Citizens United. These resolutions will hasten the day when corporations stop buying elections in Hawaii, and across America. But we still need your help. Join us and take action by writing to our U.S. Senators and Representatives to get money out of politics by amending the U.S. Constitution. Click here for more user friendly link to contact our Congressional Delegation. Click here to learn how kids can make their voices heard. Mahalo for making your voice heard and helping to reduce money’s influence on politics! On April 25, 2016 HCR 29 which was introduced by Representative Nicole Lowen and had a total of 45 co-sponsors, unanimously passed both chambers of the Hawaii State Legislature.The resolution renews the call on Hawaii’s Congressional Delegation to support a constitutional amendment to overturn Citizens United. Click here to learn more about the resolution. Thank you Maui County Council, under the leadership of Policy and Intergovernmental Affairs Chairman Mike Victorino, for passing Resolution 15-124 “Requesting Maui County’s Congressional Delegation to Support an Amendment to the United States Constitution to Permit Congress and the States to Regulate the Influence of Corporate Power on the Political System”. This resolution shows our County Council’s support of overturning theCitizens United v. FEC Supreme Court decision, which made it legal for corporations and other special interests to spend unlimited amounts of money to influence elections, as long as they are “uncoordinated” with candidates. The Citizens United decision has released a flood of corporate campaign funding and actively diminishes the integrity of our democracy. In 2014, super Political Action Committees spent $7.9 million to influence the election of various political candidates throughout Hawaii. In addition, Monsanto, Dow and other multinational corporations spent over $9 million against Maui’s voter initiative on genetically engineered organisms. This excessive money from super PACs gives corporations disproportionate influence with politicians. We now join Honolulu, Kauai and Hawaii Island counties in making this proclamation that Citizens United needs to be overturned through a constitutional amendment. Our county should be proud to be a part of the grassroots movement of nearly 700 communities across the nation that are demanding campaign finance reform. Amending the U.S. Constitution to overturn Citizens United is a daunting but achievable task. Article V of the Constitution gives us the right to amend the constitution with the approval of two-thirds of Congress and then ratification from three-quarters of the states. The process may be long and difficult but when everyone raises their voices, change can happen. For instance, in 1920, what then seemed impossible and now seems like a no-brainer, the 19th Amendment, giving women the right to vote, was passed. With your help we can make history again. Senator Schatz, Senator Hirono, Representative Gabbard, and Representative Takai are all in support. Call or write them to make this issue their priority. In the meantime, we can reduce the corporate influence of money on politics and elections here at home. Public financing of campaigns is a powerful alternative to the bankrolling of campaigns by private special interests, especially when coupled with increased transparency. Public financing, also known as “Small Donor Matching,” is a voluntary program, where candidates running for elective office raise small amounts of money from the public which the state then matches. Candidates who qualify and are awarded funds from the Public Financing program can’t accept large sums of contributions from special interests. By taking part in the program, candidates can spend less time fundraising, spend more time on policy, and are not beholden to special interests. Hawaii taxpayers who want “citizen owned” versus “special-interest owned” elections can make their voices heard every year at tax time by marking “yes” on their return for $3 to go to the Hawaii Election Campaign Fund. The fund not only supports Hawaii’s public financing program, but also the Hawaii Campaign Spending Commission, a watchdog agency that works to ensure that campaign donations and expenditures are made public and comply with campaign finance laws to prevent corruption in politics. Marking “Yes” on your tax return will not affect an individual or couple’s tax refund. As voters we can take back democracy by voting for candidates who are not influenced by corporate money. Judge a candidate by their policy positions, character, and intellect as well as their campaign contributions. On the Hawaii Campaign Spending Commission’s website you can view candidates’ and non candidate committees’ (including Super PACs’) donations and expenditures. Often, where a candidate receives their funds can provide valuable insight into their priorities. Let’s reign in campaign spending and ensure that our lawmakers truly represent us and what’s best for Hawaii. Arianna Feinberg is a small business owner and political activist with a special interest in native ecosystem restoration, civil rights, and campaign finance reform. She is a volunteer for Common Cause Hawaii. 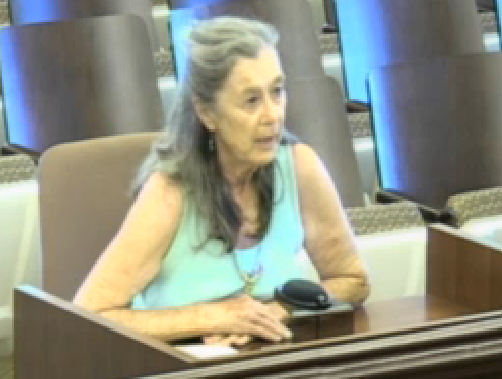 A resolution to overturn Citizens United was pitched to the County Council, but they fumbled the catch. The U.S. Supreme Court’s 2010 Citizens United decision declares corporations to be “persons” with respect to speech, allowing them to spend unlimited amounts of cash to influence elections. Consequently yours and my vote counts less, and corporations’ and rich people’s vote counts much, much more. At the insistence of Councilmember Arryl Kaneshiro, the council struck the heart from the resolution, that saying corporate executives are bound by fiduciary laws, with penalties to include personal legal liability, if they do not put profits above the public’s rights and welfare. This council’s established voting bloc consisting of Mel Rapozo, Ross Kagawa and KipuKai Kualii provide cover for Kaneshiro. Opinion polls show overwhelming opposition to Citizens United, an inconvenient truth dealt with by removing the proviso about opinion polls from the resolution. Mr. Kaneshiro works at Grove Farm. They lease to Dow, Pioneer and Syngenta, corporations with a clear path to influencing our elections, thanks to Citizens United. He should have been recused, as he was when the council took up a South Shore development plan. The appearance that Mr. Kaneshiro represented special interests, and his own paycheck, over the interests of his constituency on Kauai who understand the threat Citizens United poses to fair elections and consequent subversion of Democracy in America, is hard to contest. The will of the people was denied on this one. Score: Corporations doing business on Kauai, 1, Voice of the People, 0. On June 24, 2015 the Kauai County Council’s Committee of the Whole voted to approve Resolution 2015-44, which stated that money does not equal free speech and corporations are not people. This brings us one step closer to overturning the horrendous Citizen United Supreme Court decision. It is thanks to YOU, that the Committee was able to reach a unanimous decision! Thank you to everyone who contacted the Kauai Councilmembers in support of this important resolution. 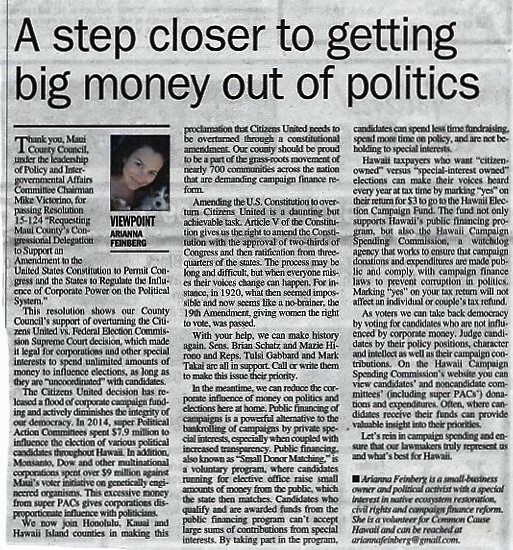 Let’s keep up this momentum as we work to urge all Hawaii counties to support a resolution to overturnCitizens United! Resolution 2015-44, Draft 2 was one of the last items on the agenda for June 24, 2015 Kauai County Council meeting. The meeting began with Councilmember Kaneshiro proposing an amendment to remove “Whereas proviso 8”, however it failed due to a technicality, since the full council was not present at the time of the vote. The Council then heard from testifiers, who waited for more than 5 hours for their chance to speak in support of the resolution. Thank you Sandy Herndon, Matthew Bernabe, Lonnie Sykos, and Felicia Cowden! You can watch the recording of the hearing here (skip to 05:05:48). Councilmember Yukimura then proposed 3 amendments, in an attempt to compromise after hearing her fellow councilmembers’ concerns at the meeting 2 weeks earlier. The third amendment would add a 14th “Whereas proviso”, which would state: “Whereas there is widespread opposition to Citizens United ruling that money is speech and that independent corporate campaign spending cannot be limited.” This passed unanimously. With a new draft in hand, the Council then voted unanimously to pass the resolution. Money is not speech. The Constitution needs to say so. Five years ago, a Supreme Court decision changed the course of democracy in America. Do you remember the non-stop ads this fall about the GMO Moratorium? Monsanto, Dow and other multinational corporations spent $7.9 million on ads against Maui’s Voter Initiative on Genetically Engineered Organisms, more than $350 for every “no” vote. There is an enormous issue here, but it’s not just GMOs. It’s Citizens United. January 21, 2015 was the fifth anniversary of Citizens United, the Supreme Court’s decision on what corporations and unions can spend to sway voters through independent communications like TV ads. It removed all limits on such spending. All limits. Citizens United led to other court decisions that allowed “Super PACs,” the groups through which wealthy individuals can also spend unlimited amounts on “independent expenditures,” e.g., TV ads and mailers. And have they been spending? They’re trying to buy elections like shopaholics on Black Friday. In the first election after Citizens United, outside spending nationally increased 346% over the previous midterms. In the first presidential election after Citizens United, it increased 206%. In last year’s election, more Super PAC money was spent in Hawaii than in any election cycle in state history: $10 million on ballot initiatives and $5.9 million on candidates. In January, the Koch Brothers announced that they will spend $889 million on 2016 campaigns, more than the Republican National Committee and the party’s two congressional campaign committees spent, combined, in the last presidential election. Because Citizens United is a Supreme Court decision, the President and Congress can do nothing about it, directly. The only way to change it now is by amending the U.S. Constitution. The process is to build support nationally for an amendment by passing state, county and city resolutions. These resolutions pressure members of Congress to introduce a federal resolution for a constitutional amendment. Once that passes both the Senate and House by a two-thirds vote, three-fourths of the states must ratify it. And then the Constitution will be amended, just as it was designed to be by its framers. If this sounds unlikely and extreme, consider that the women’s suffrage movement created the 19th amendment 45 years after a Supreme Court decision ruled that the U.S. Constitution gave women no right to vote. In hindsight, women voting doesn’t seem particularly extreme. Today, corporations and money play far greater roles in politics than in 1787. The Constitution badly needs an update to clarify what corporations and money are and are not. Corporations are not people, and the Constitution needs to say so. They don’t go to high school, have children, or die. They are artificial legal entities that were originally meant to be temporary but they have thinly accumulated constitutional rights over many decades through inconsistent application of case law, as interpreted by pro-corporate judges. Money is not speech, and the Constitution needs to say so. Proponents of Citizens United argue that it protects free speech by allowing anyone to speak without limitation. That sounds reasonable. But imagine five people in a room trying to have a conversation and only one has a microphone that no one else can afford. Each time someone tries to speak, the person with the microphone drowns the others out. That, in effect, is what Citizens United has allowed. Is that free speech? Sixteen states—Hawaii was first—and nearly 600 cities and counties have passed resolutions supporting an amendment to reverse Citizens United and related decisions. The City and County of Honolulu, and Hawaii County, have passed such resolutions. The time is ripe for the Maui and Kauai County Councils to pass resolutions. They will contribute, in the spirit of actual free speech, to the movement to pass an amendment. Resolutions will hasten the day when corporations stop buying elections in Hawaii, and across America. We urge you to write to Maui and Kauai County Council members and our U.S. Senators and Representatives to get money out of politics by amending the U.S. Constitution. We’ve amended it before to create a more just and free society and we can do it again.